8-9 October 2015. 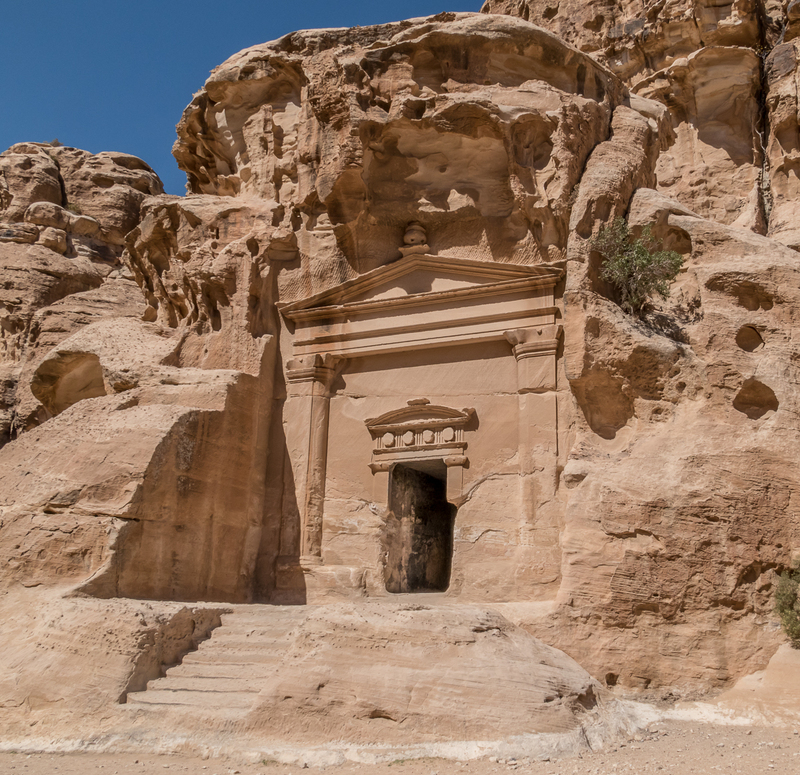 In an arid mountainous desert region over 1000 metres (3400 ft) above sea level, and some eight kilometres (five miles) north of the town of Wadi Musa, is the archaeological site of Siq al-Barid, commonly known as Little Petra. Siq al-Barid is situated in a short high gorge, and, like Petra itself, has the same familiar buildings, with carved facades, excavated into the sandstone canyon. Siq al-Barid is quite short, only about 400 metres (1300 ft) long, unlike the Siq at Petra, which is over one kilometre. As we enter through the high walls of the gorge we are aware that almost no sunlight penetrates. 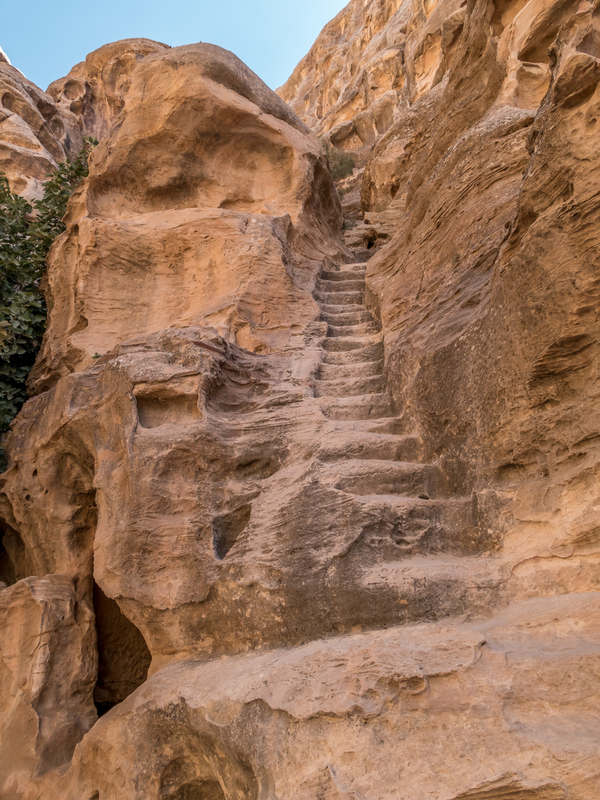 Siq al-Barid, meaning “cold canyon”, lives up to its name. There are temples, houses, and large dining rooms for entertaining guests. 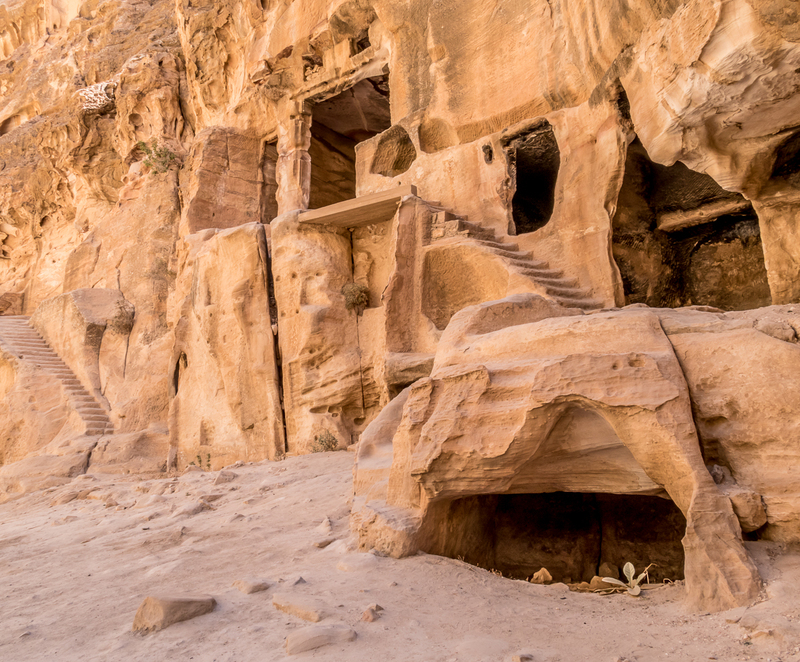 Established in the 1st century AD when Nabataean culture was at its height, archaeologists believe Siq al-Barid was an affluent suburb of Petra, a thriving community some five kilometres from the main city, housing merchants, traders, and their visiting counterparts. At one time, almost two thousand years ago, it was humming with life. After the decline of the Nabataeans it was gradually abandoned, and for centuries was used only by Bedouin nomads. selling trinkets to tourists high up at the top of the ancient stone stairs. He lives here, at least part-time, with his wares spread out on the rock shelf in front of his tent. 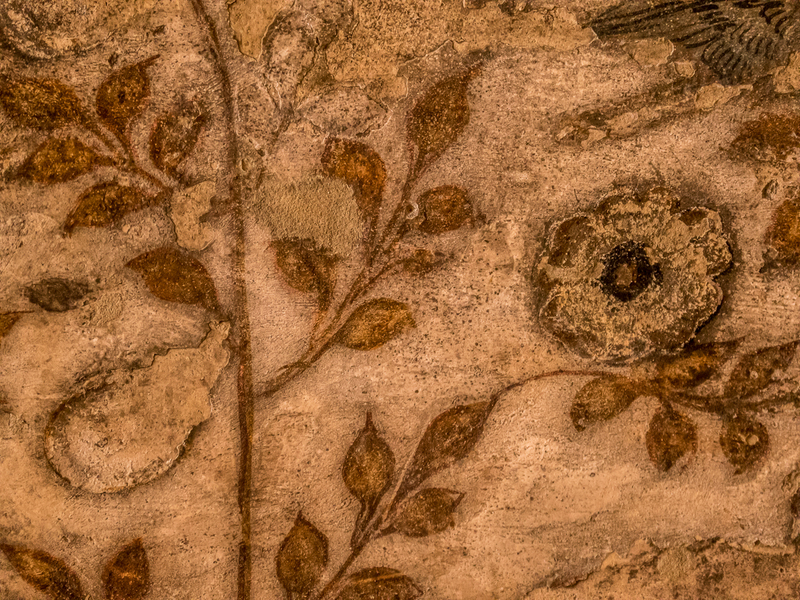 Within one of the large dining rooms there are 2,000-year-old Hellenistic-style wall paintings that had been obscured for centuries by soot, smoke and graffiti until they were discovered in 2010. They were created by the Nabataeans, who traded extensively with the Greek, Roman and Egyptian empires, and give a hint as to their lifestyle. The paintings include three kinds of vines, all of which were associated with Dionysus, the Greek god of wine, and the surrounding land shows evidence of ancient vineyards and grape-pressing sites. Apparently their lifestyle was very good. and many others like them. 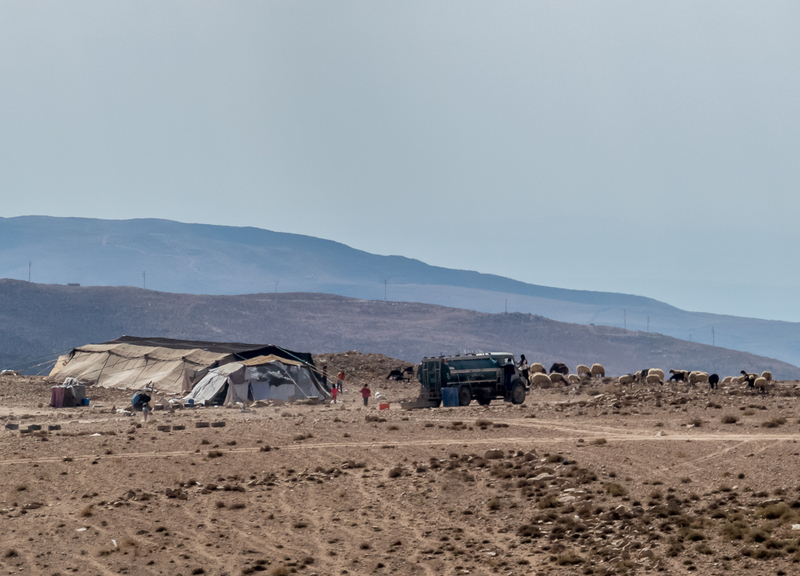 They are Bedouin camps, easily distinguishable by the style of tent known as beit al-sha’ar, or “house of hair”. The tents are made from goat hair. Bedouins have been roaming the desert sands for centuries and have fashioned a life in this unforgiving environment. Scarcity of water and pasture required them to move constantly. 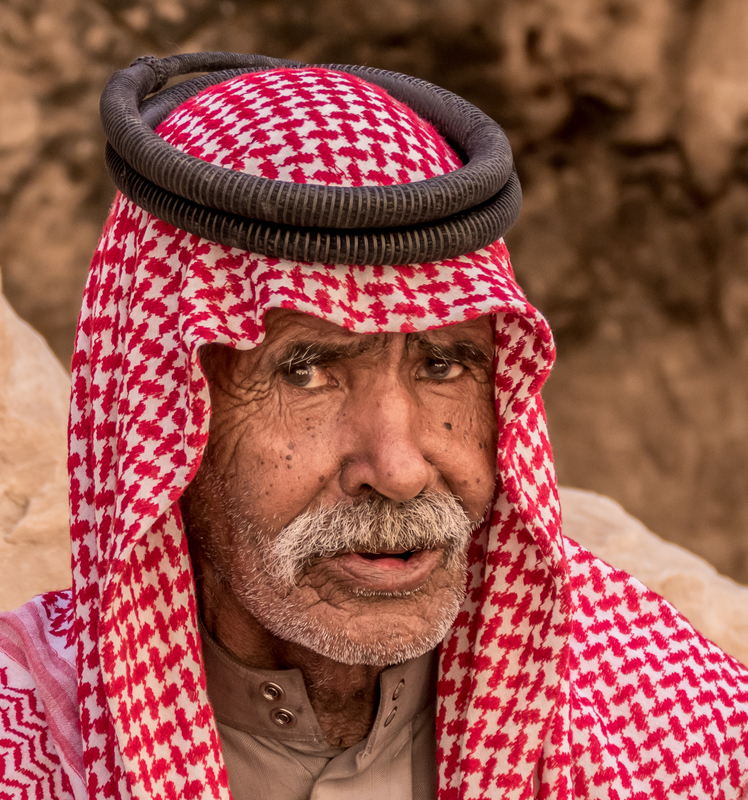 Between the 14th and 18th centuries tribes migrated from the Arabian Peninsula to what is now Jordan, and today Bedouins make up about forty percent of Jordan’s population. The word bedouin, or bedu, simply means “desert dweller” in their native tongue of Arabic. camels, and sheep, which they use for meat, dairy products, and wool. Each family has its own tent; a group of tents constitutes a clan; a number of clans make up a tribe. 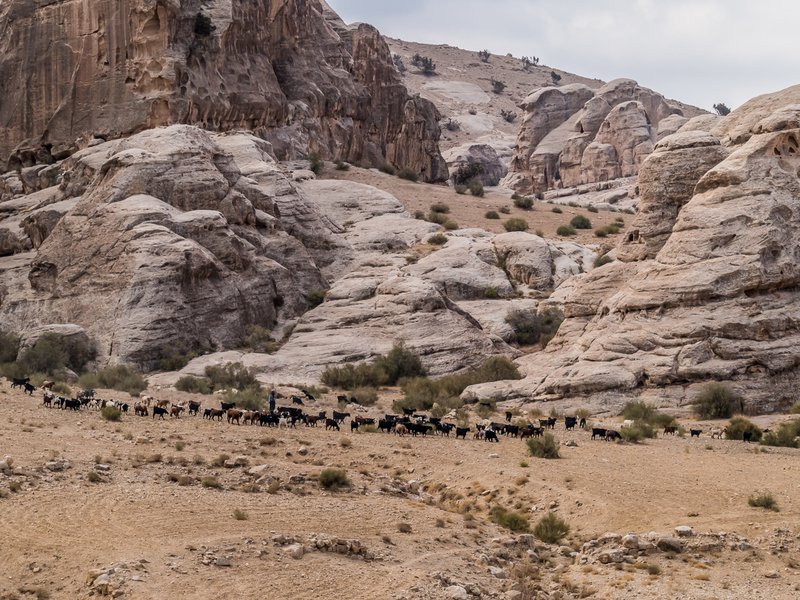 There are more than twenty nomadic or semi-nomadic tribes in Jordan. Although the Jordanian government in the past promoted the settling of the Bedouin, it now recognizes the value of their unique contribution to Jordanian culture and heritage. 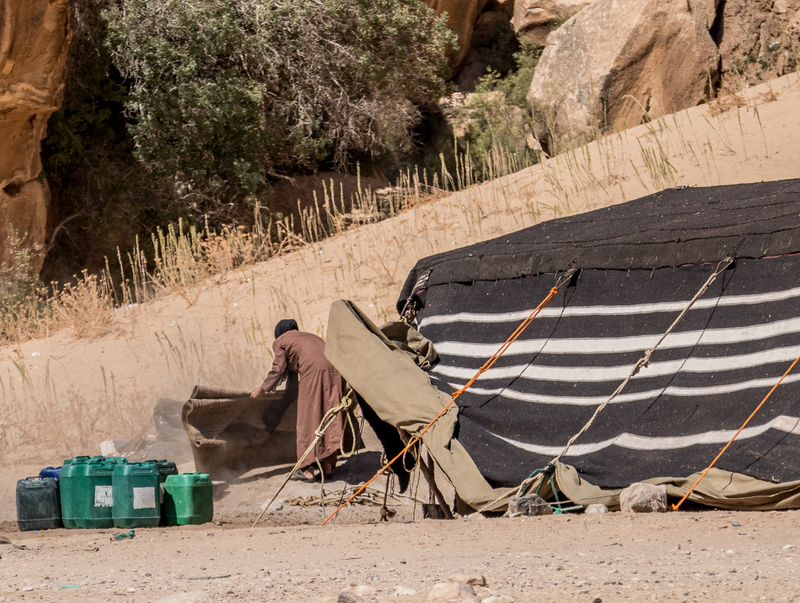 The government provides education, housing and health clinics, however many Bedouin prefer to live in the traditional way that for centuries has served them so well. 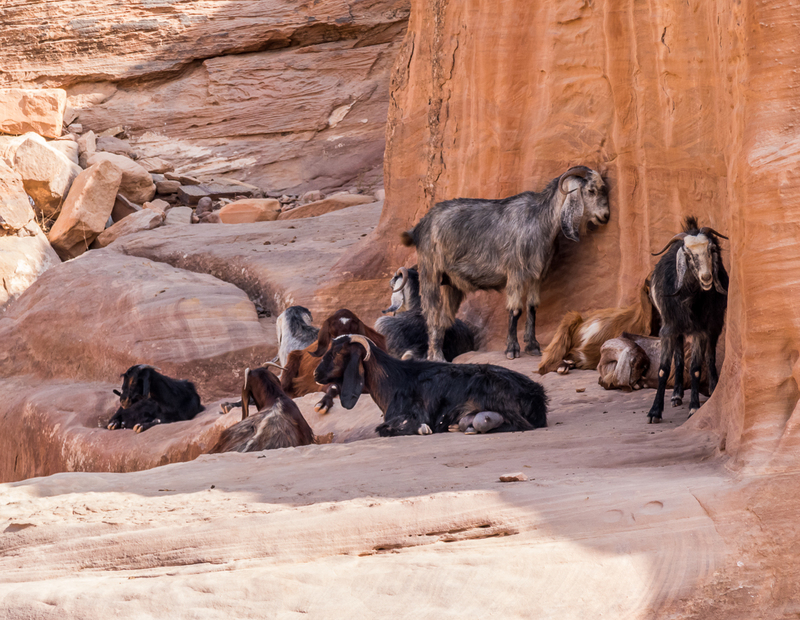 Hiking in the high country around Petra we notice a herd of goats, and their young Bedouin goatherd. She waits with this nanny who had given birth to twins moments before we walk by. The Bedouin of Petra, known as the B’doule, are from the Huwaitat tribe, and claim to be the direct descendants of the Nabataeans. 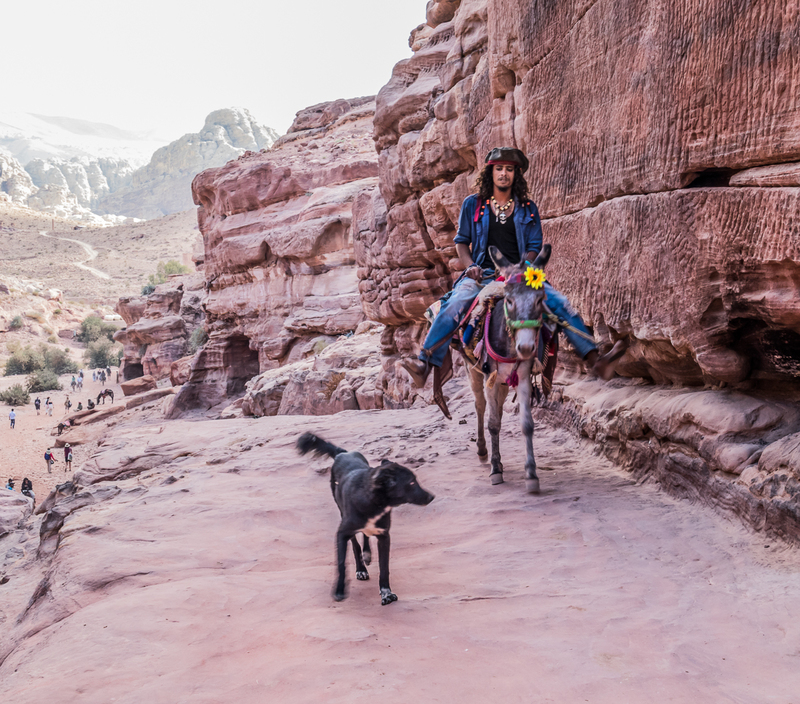 When Petra was awarded UNESCO World heritage status in 1985, the B’doule, somewhat reluctantly, were moved from Petra by the government of Jordan to a purpose-built village nearby where most still live. 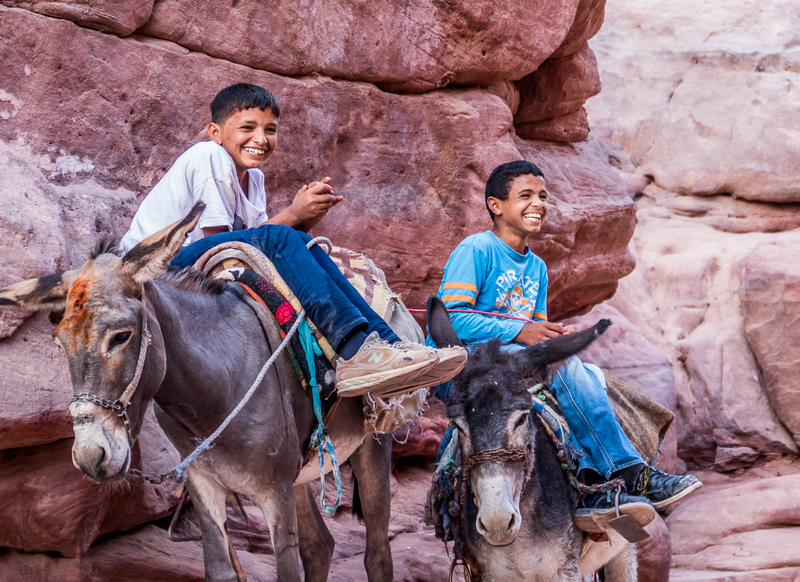 Feeling a strong connection to the site, most come to Petra daily to earn a living selling traditional crafts and donkey and camel rides to tourists. and boys learn young to wrangle donkeys. Petra is their home and their playground. 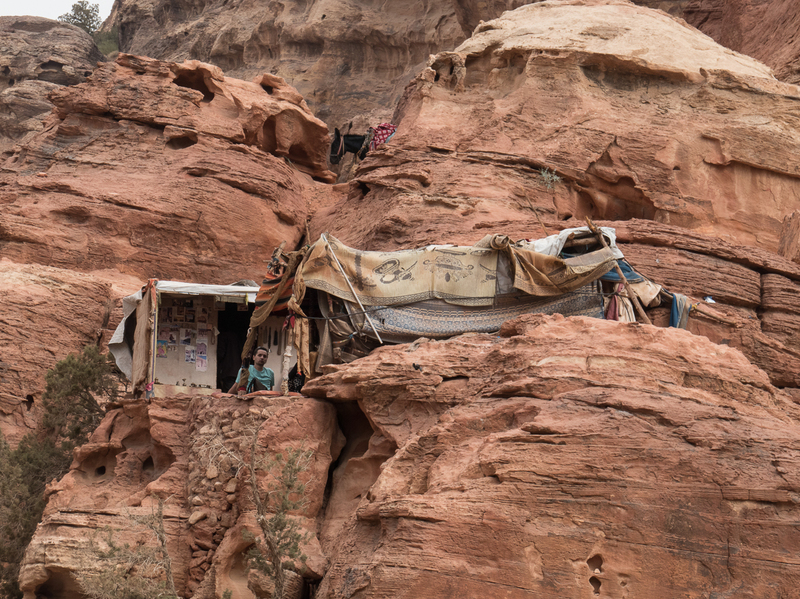 Some one hundred and fifty people who refused resettlement in the village still live the traditional way in the Petra area. 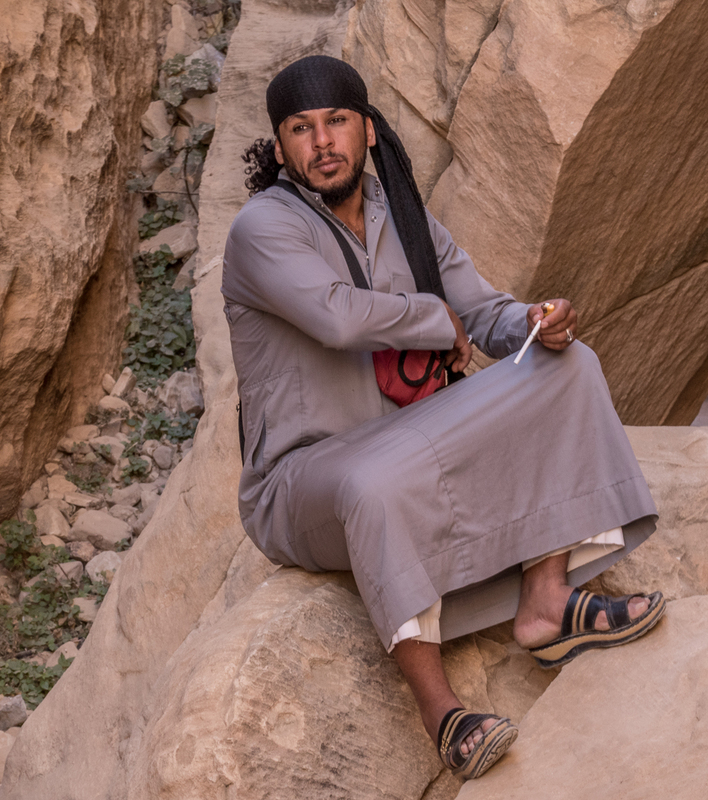 Tofik Abdullah, 28: “My family has been in the caves of this area for more than 450 years. They came as nomads with goats, camels and sheep and they followed the land. Their camels found water springs here, and they found grass and then the caves – it is peaceful and so they decided to stay”. “More people are moving back [to the valley and caves of Petra] because in the village we don’t have any more land to build on. We’ve tried talking with the government to ask for more land, but they say it isn’t allowed. I think there are more than 700 families who don’t have houses and are living in cramped conditions with their parents”. 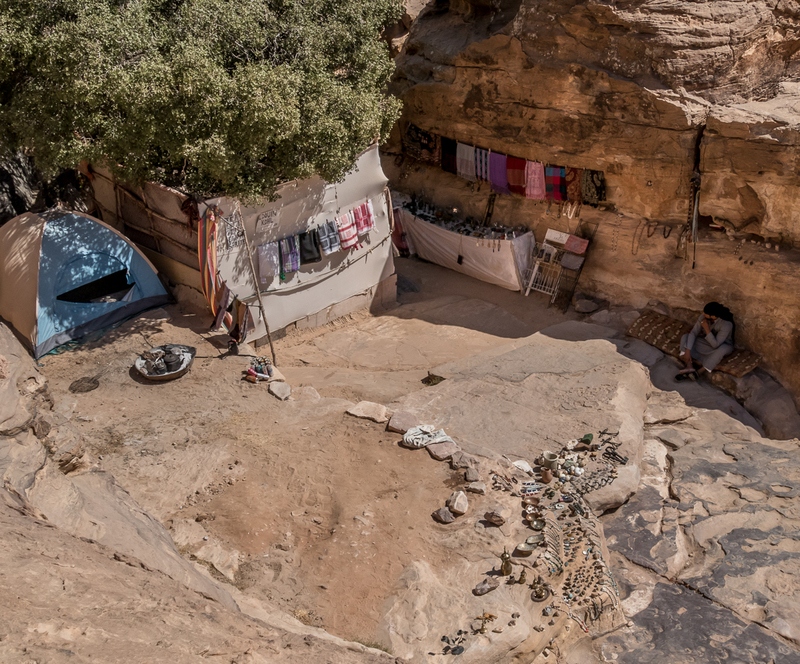 The Bedouin provide a link back to the Nabataeans, desert dwellers who have learned through ingenuity and necessity how to survive in a harsh, dry climate. We had little direct contact with them, highlighting the limitations of being on a tour rather than independent travel. 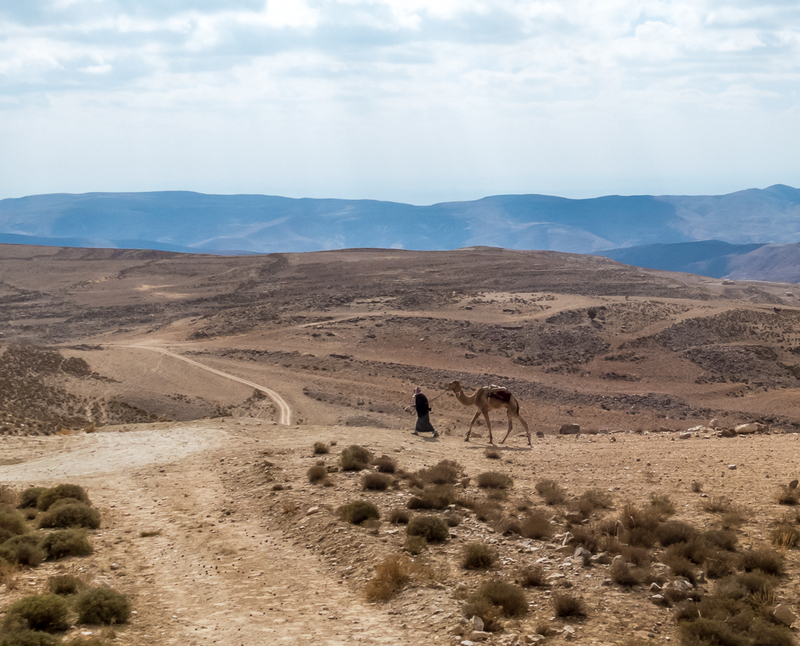 Had we been travelling alone it’s likely we would have looked into the possibility of visiting a Bedouin community, but it’s the same wherever we go – there’s never enough time to do everything. 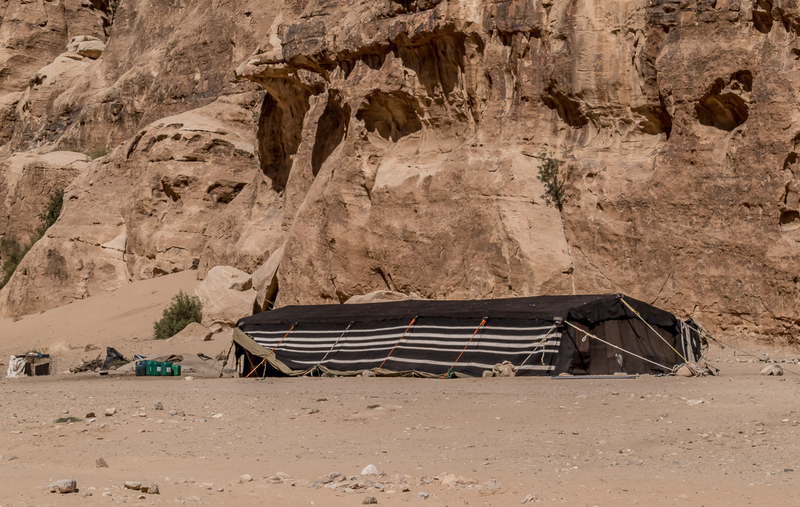 Next post: The breathtaking desert landscape of Wadi Rum and another glimpse of the Bedouin lifestyle. Beautiful people, place and culture. A place I’ve always wanted to see. Thank you for the tour. Yes, beautiful people. I wish we could have connected more with them and their lifestyle. As it was, it was only glimpses. I’m glad you enjoyed the tour. Thanks Curt. I too am attracted to the Bedouins, having first encountered them travelling through northern Africa way back when. I’d love to experience more. We’re planning a trip to Morocco next year so maybe then. 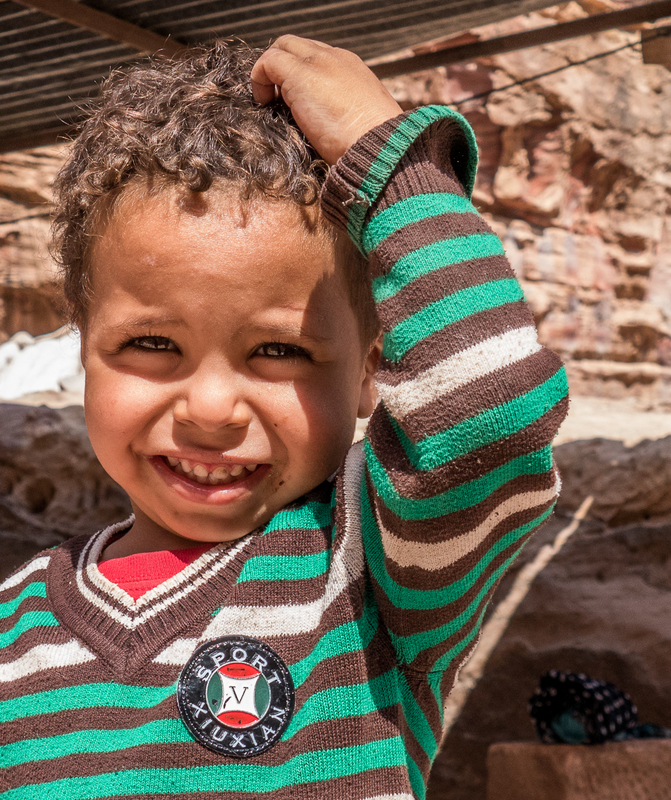 I hope you get to Petra and Little Petra one day – definitely worth visiting. and compelling tale of these resilient desert dwellers! in this ancient, stark landscape. I wish for a deeper contact than what we could see from the bus window, or the traders for tourists at Petra. One day maybe. They seem so grounded and resilient. I do think from what I’ve read that the societal structure is quite strict, as has been the case in tribal groups from the beginning. What works for the good of the whole gets ingrained. I read about the recent find. That will be something to uncover! Very detailed blog with beautiful pictures! I had never heard of Little Petra, although Petra has long been on my bucket list. Amazing photos, thank you! Thanks so much Anne. Petra really is one of the great wonders of the world. I hope you get there one day. I vaguely heard about Little Petra before, so thanks for writing about Petra’s less-known little sister. It is amazing how some communities around the world still retain their nomadic life in the 21st century. 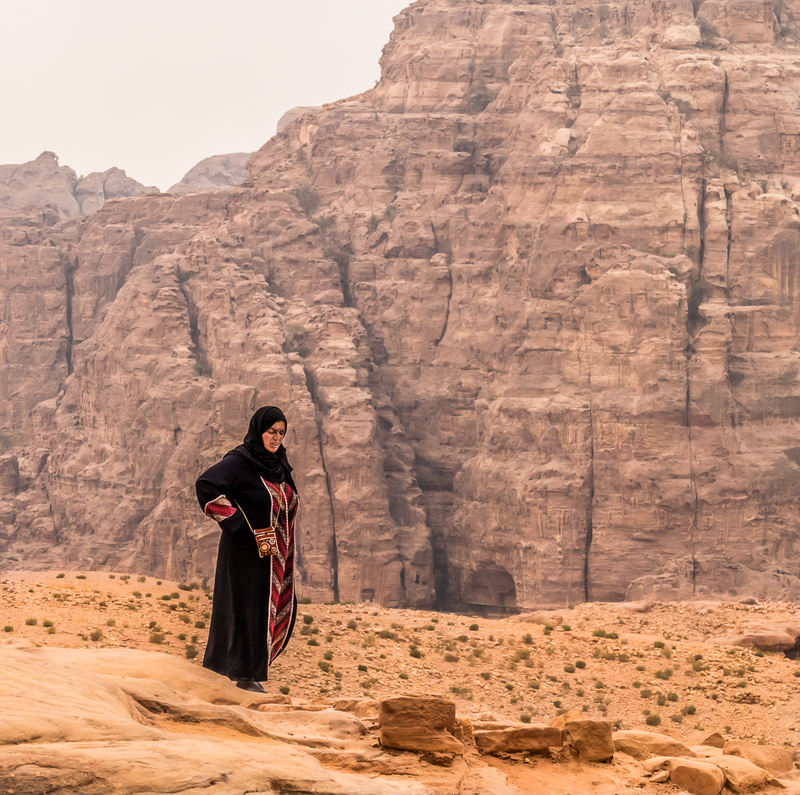 People have a better state of mind when they are connected to the nature, so I’m glad the Jordanian government changed their policy towards the Bedouins and let them preserve their culture. I so agree about being connected to nature, from personally experience! I lived a lifestyle very close to the land (though not nomadic) in the far north of Canada for many years. It’s always deeply nourishing. I to am glad the Bedouin have been allowed to continue their nomadic, natural lifestyle. I think we badly need more grounded people on the planet! Thanks Hedy. I hope you get to a desert one day. Deserts are very special, and there’s enormous variety. I was really trying to capture the people and their land, their close connection to it, their way of life. It was fascinating to see. Alison until reading your post I did not even know there was a Little Petra. I have always thought of Petra as a place, a destination and today I have learned about it’s amazing people. Thanks you for the beautiful images that shall be dancing in my dreams. Thanks so much Helen. 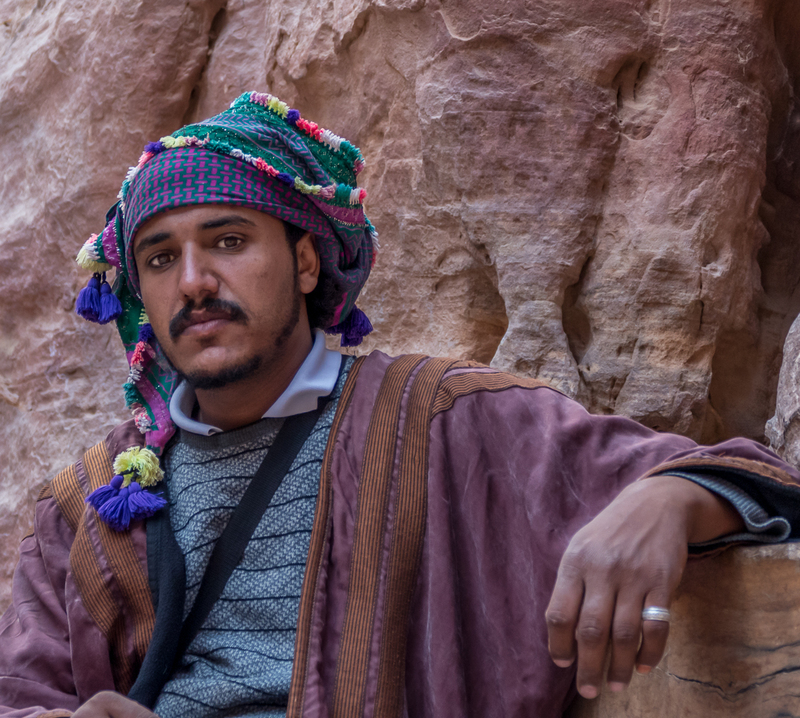 I was fascinated by the people of Petra, and I think our guide may have mentioned that they were Bedouin. Our guide did not mention the tents and if I hadn’t asked what they were as we drove by none of us would have known. On the other hand he did give quite a long talk about the Bedouin when we were at Wadi Rum. I wish we’d had the time to explore further. 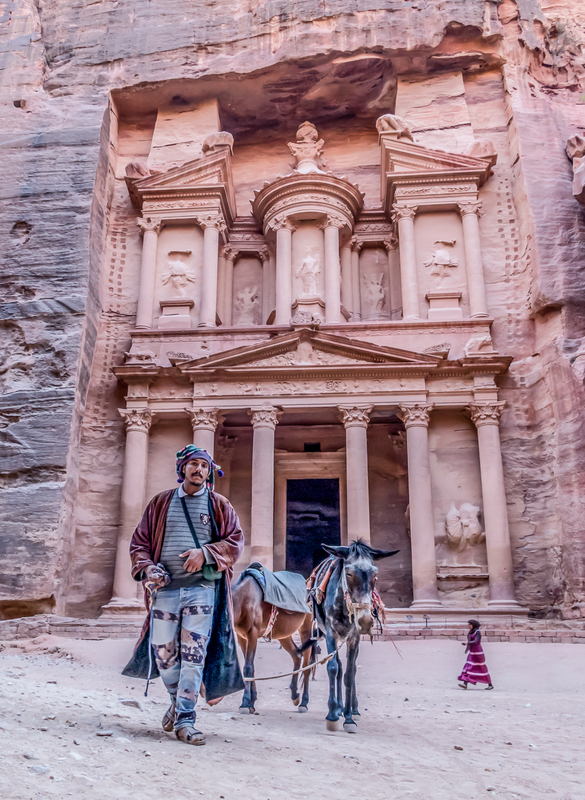 The overwhelming feeling I had when reading the beginning of your post was how fleeting and impermanent our world is when we think about Petra and Little Petra as vibrant, thriving, sought-after cities with free-flowing wine, an arts scene, etc. And now dust swirls in the doorways and a few men try to eke out a living on centuries-old memories. Which of our big cities and lifestyles will go this way millennia from now? I am really into reading about nomads right now as I prepare for my trip to the Mongolian steppe! 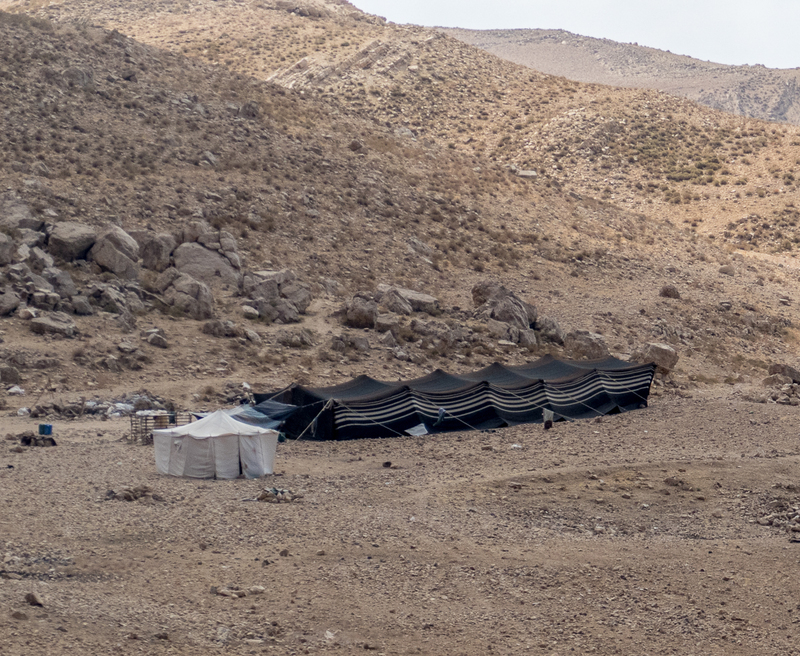 I remember seeing the Bedouin tents in the Jordanian countryside and marveling at their lifestyle; I did feel some amazement by the presence of the big ol’ pickup trucks outside most tents, though! 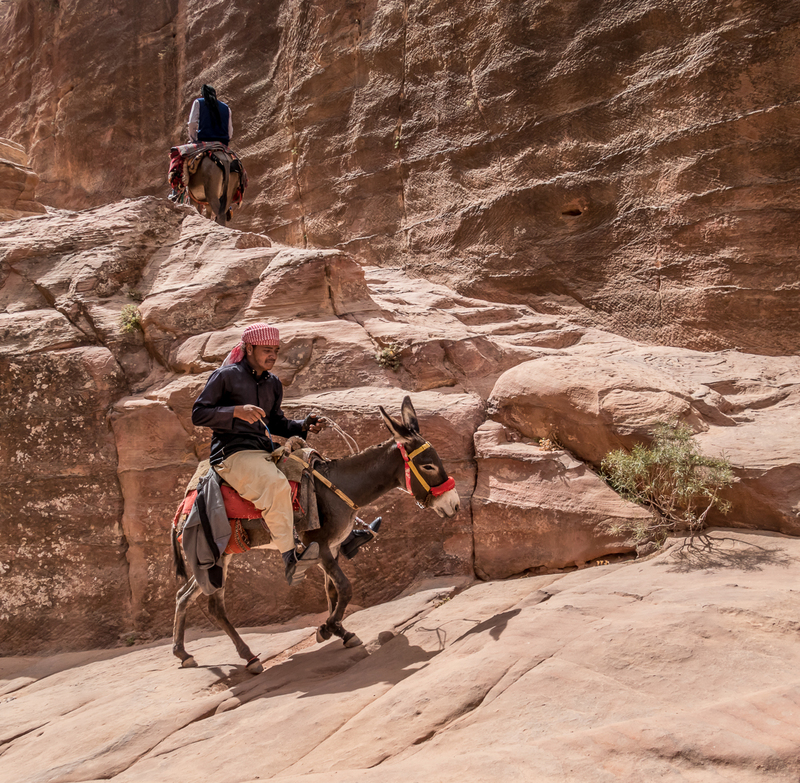 Lastly, I SWEAR we saw that same Johnny Depp lookalike (with the kohl-outlined eyes and flamboyant headgear and jewelry) on horseback at Petra! Handsome guy, no? Yes, fleeting and impermanent. When I’m in places like Petra and Little Petra I try to imagine what it was like. Thousands of people lived, laughed, loved, worked, struggled, cried, and died in what was a city they probably thought would never end. And yet, of course, everything ends eventually. Wouldn’t it be fun to come back a few thousand years hence and visit the ruins of a city we’ve lived in? I wonder if we would ‘remember’ anything, even if it was just feelings. A trip to the Mongolian Steppes! Wow! How fabulous. You must be excited. When do you go? We loved the Johnny Depp lookalike. I bet it is the same guy. He does have a way about him! And yes, handsome. I am indeed excited for Mongolia! I leave in late July and return mid-August – simply cannot wait and am reading all sorts of Mongolian things! I love this post. You have done a thorough job of researching and presenting the Bedouin to us. Thank you. I have always been intrigued with these people who have existed for such a long time. The pictures, as always are incredible. Thanks Darlene. I wish we’d had a chance to connect more with the Bedouin. I too am intrigued by ‘ancient’ tribes that still thrive. Maybe we’ll just have to go back! Interesting, as usual. One wonders if there was more water, 2000 years ago in the height of the Nabataeans, or just fewer people drawing on it? Thanks Dave. I think the water situation was much the same. My understanding is it’s mostly dry, but flash floods come, and the Nabataeans worked out through the use of dams and aqueducts how to harness, store and ration the flood water. They were extremely ingenious with the way they controlled the water and through that were able to create an artificial oasis at Petra. This was the basis of their growth into an empire. Today the water is still controlled in a similar way, and the Jordanian government has built a modern dam in the same place as the old Nabataean dam. Well done! Thank you walking me through the life and hardships the people of Jordan. You created a sense of awareness for us and telling us their side of the story. And I love your pictures, it flows perfectly with the story. Thank you Suzanne. I’m glad you enjoyed the post. It was fascinating to learn something of the people of this part of the world. 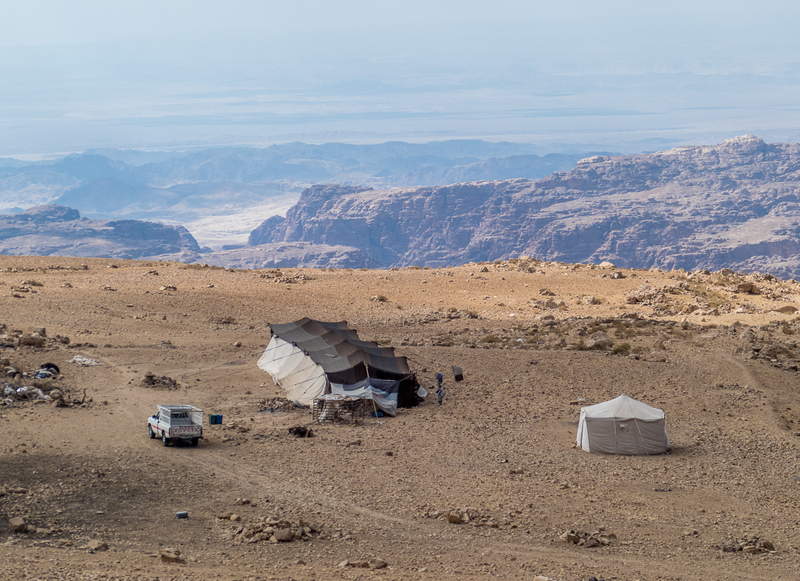 I didn’t even really know that there were Bedouin tribes in Jordan, or that they still existed. 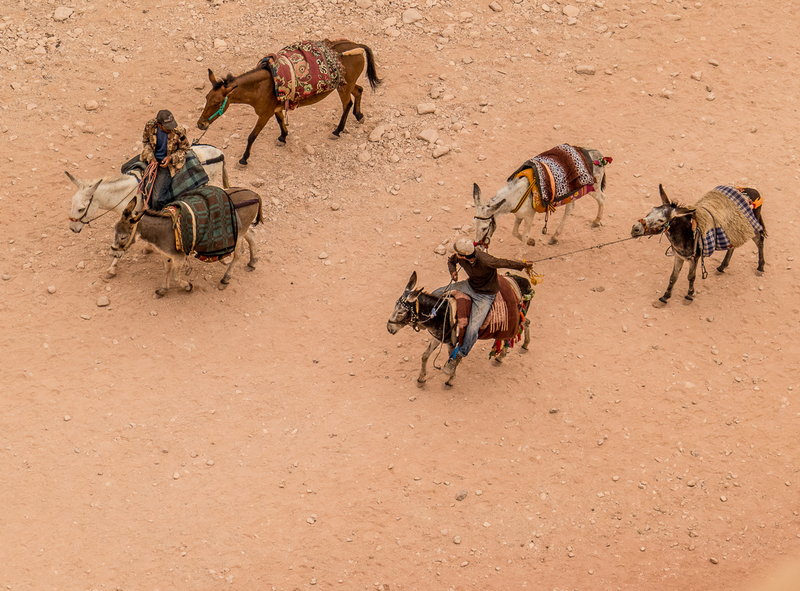 The Bedouin seem to have perhaps a harsh life, but I think they do quite well. From my reading there are many who choose it when they could be absorbed into regular society if they wanted to. I think the Jordanian government takes good acre of its people. Your photos… stunning, yet again. Can’t get enough and can’t wait to see Wadi Rum! Thanks Kelly. Wadi Rum coming up! As always, a fascinating tour and beautiful photos. Thank you SOOO much. Thank you Ros! I’m so glad you enjoying the blog. Jordan is definitely a fascinating country. Fascinating.They seem to be leading a charmed life. I found it fascinating. I’m not sure they have a charmed life. Many of the B’doule depend on income from tourists and there has been a huge downturn in tourist revenue since the Syrian civil war. No-one wants to go to that part of the world any more. I think probably the nomadic and semi-nomadic Bedouin have it better since they are relying on traditional methods for their living, and I think they have a deep grounding in the land which always helps stability and resilience, but at the same time I think it’s probably in some ways a quite hard life. They do look happy and content. Thank you so much Aishwarya. 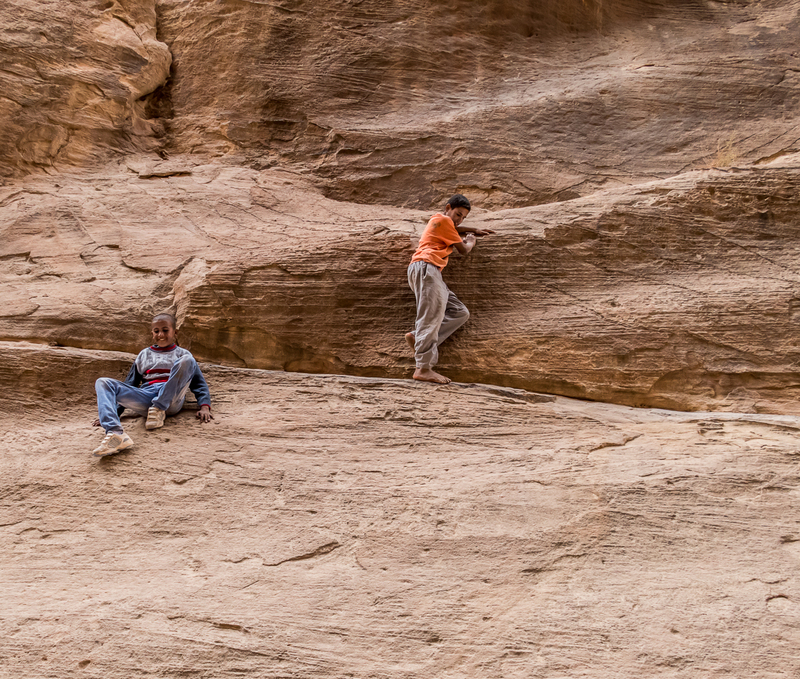 I loved watching those two boys on their donkeys, and the other two boys climbing all over the walls of the Siq. Great post Alison! I love the photo with the musician Bedouin.. I think the photo is good as a cover for your previous post title “half as old as time”.. we can see how harsh the life is there.. Thanks Christie. Yes I think he probably as had a harsh life, and at the same time I see wisdom in his eyes. He was certainly not making a lot of money sitting there. 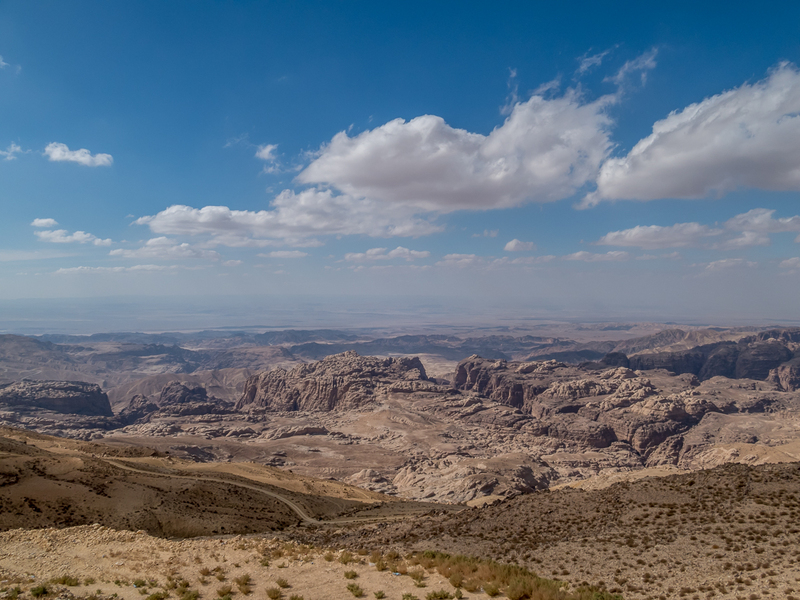 There are so few tourists in Jordan these days and even fewer at Little Petra. Maybe he chooses to be there in a place he loves and feels a connection with. I hope so. Thanks so much Nurul, I’m glad you enjoyed the post. Petra is such a special place! Kind of like a surreal mirage. Great post, thank you. Fabulous photos and interesting narrative. Your posts inspires us to see more of the Middle East. Thanks so much Mark. We were in Jordan and Egypt last October and had an excellent time. Jordan is kinda hard to get around, and we felt Egypt could be a bit sketchy so for the first time in both places we went on tours rather than independent travel. There’s something very relaxing about taking a tour. I really encourage you to go. Both places are really hurting for tourist dollars, and seem to be pretty much as safe as *anywhere* in the world these days. Thanks Anita. I too loved learning a little about the Bedouin, and hope to go back to that part of the world one day and spend more time with them. How they survive, and make the desert work for them, or perhaps I should say, work with the desert, is amazing. I can hardly imagine what will be left of our civilization. Certainly not grand buildings built to last the way the Nabataean buildings were. Thanks so much. I’m glad you enjoyed this little tour. I do wish we’d been able to have more than a fleeting connection with the local people. I’d love to stay in one of their camps for a few days to really see how they live in that harsh environment. 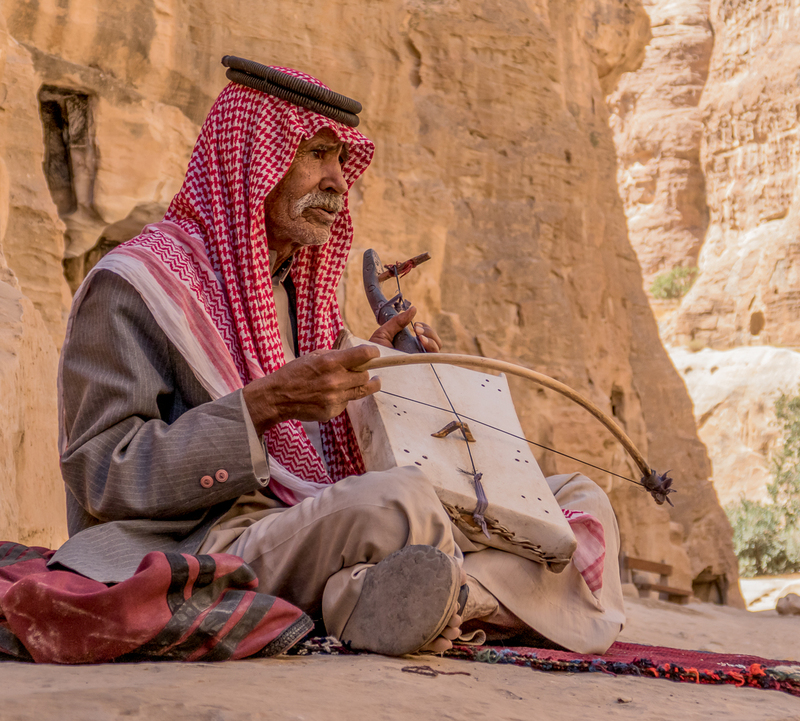 I often wonder what people like the Bedouins think about busking at places like Petra. On the one hand, it allows them to stay close to their home. But on the other hand, to come from such a proud history, to now be selling donkey rides and tourist trinkets – it must be dislocating at times. 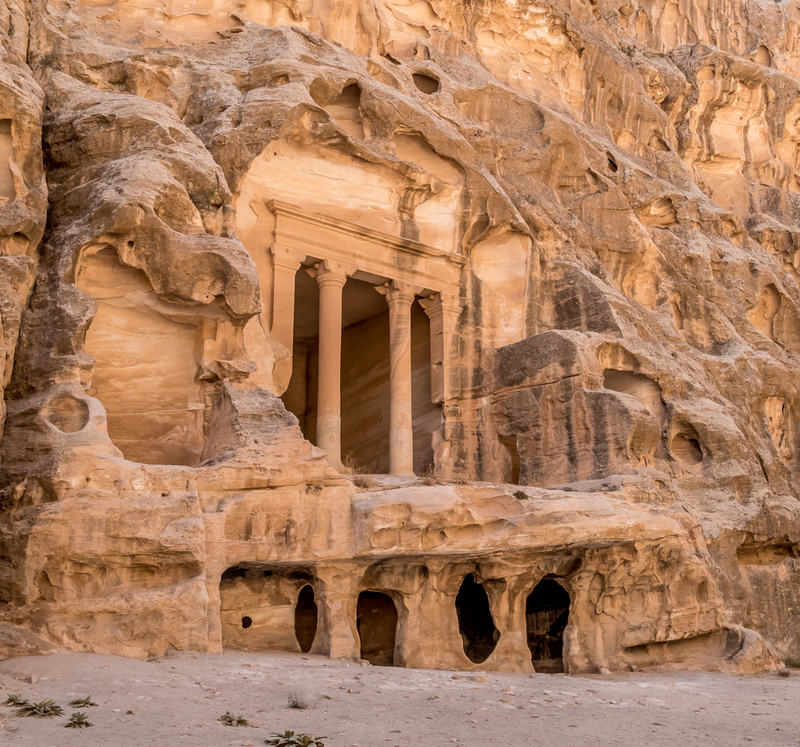 I also did not know about Little Petra, and am delighted to add it to my bucket list. Somehow, that list keeps getting longer instead of shorter! Yes, I too wonder about that. It’s as if their special place has been invaded, and yet brings with it a way to make money. 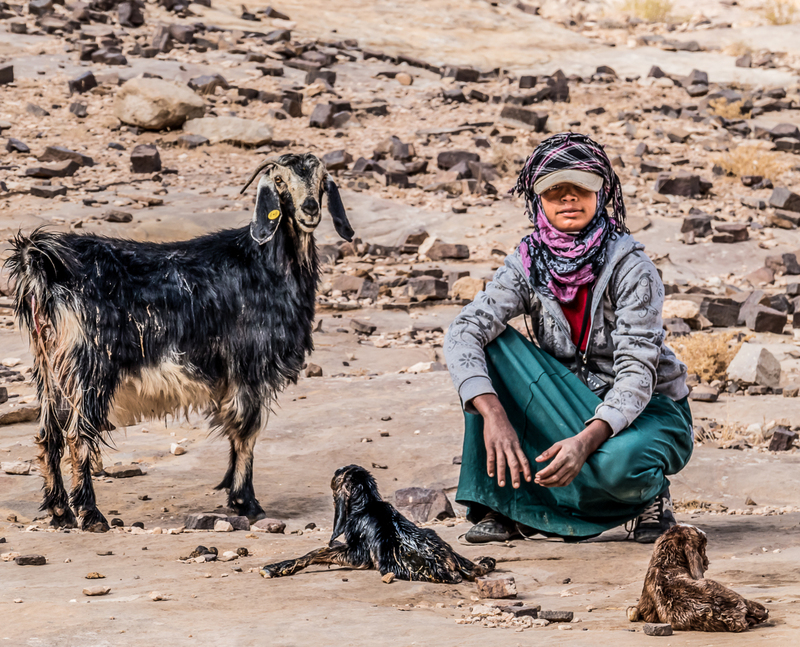 Selling to tourists is a whole different life than the life of the goatherd for instance. Some of the guys with their donkeys and camels seemed so very much at home, but the women selling trinkets not so much. Or maybe that’s just me projecting. I know which I’d rather do. 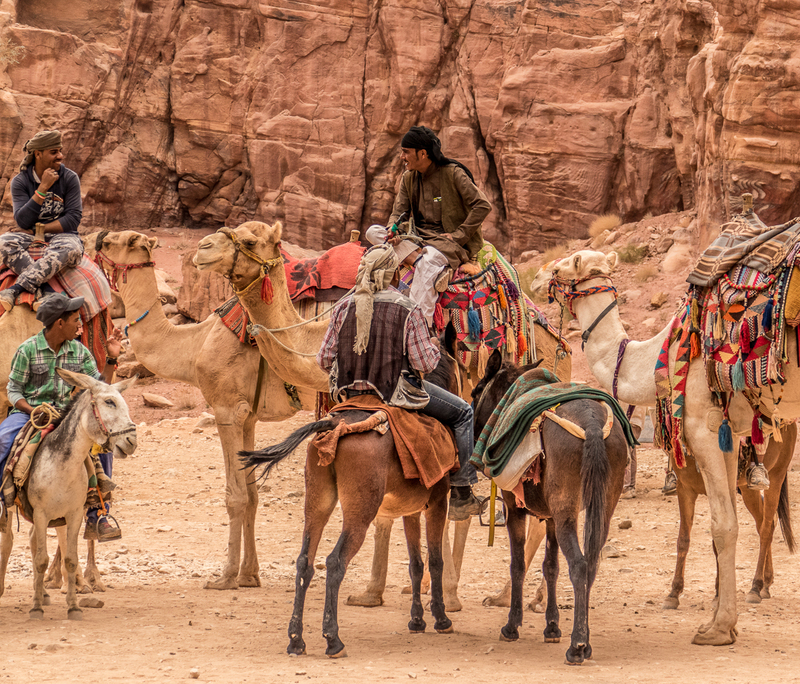 Also there has been a great downturn in recent years of the number of tourists in the Middle East so the Bedouins of Petra are hurting since they’ve become dependent on the tourist income. More are moving back into the caves and going back to living in the traditional ways. I very much enjoy this window into the world you provide. The views are all so unique, but the people always shine through. You can look at the people and instantly see how similar we all are to one another. You can see it in the clothes, the eyes, the tents, the herding of goats. You can see it in the dwellings, the open air store fronts, the stairs hewn into the canyon. We are all so very much alike. We are all so much closer to being one another, than to being separate. The beauty that shines through– the distinctions and the uniqueness– they still resonate with what is the same don’t they? Yes yes and yes to all this. The more we travel the more it is obvious to me that we are all far more alike than different. I think travelling and experiencing other cultures first hand should be compulsory education for everyone. I’m a little disappointed…because when I was there, those paintings on the cave (discovered in 2010) were not discovered yet, and I missed them! LOVE the photo of the guy on the camel with the lady’s face covered with the nqab. I was also taken with how well even young children have learned to “negotiate” or bargain when trying to sell you something. I imagine this survival technique is buried deep in their DNA? I imagine them as the people who invented commerce…and globalization. If I’ve read about a place/event before hand, if I’ve studied it years ago in school, if I’ve seen glorious photos and said *I want to see that! * then the reality is almost always more exciting than if I have no clue what I’m looking at. I finally get to see the real thing! Of course it’s disappointing if the reality doesn’t live up to my expectations, the glaring example being no water in Pamukkale. On the other hand if I know nothing about a thing or place I can be very ho hum about it. Like the Map of Madaba. I know if I’d studied that map in high school art classes I’d have been much more excited to see it. And the paintings at Little Petra. It’s only after I’ve done a little research for the blog that I begin to appreciate them. That style of painting, from that era is very rare. The guy on the camel with the poster of the veiled woman! I had no idea she was there – I was photographing him. Just lucky. Children in third world countries at tourist sites everywhere. It’s amazing how young they learn, and how they use cuteness to negotiate. I don’t buy stuff, but got sucked in by a child in Egypt selling a doll that “mommy made”, and a child on the beach in Mexico selling bracelets. I know. I keep thinking I’ll do some research before traveling (this is when I know where and when I’m going)…but I never do. When traveling Jordan, I did have a lady along and we had a guidebook, so I knew what I was looking at when we saw the Madaba map. And sometimes it’s the lucky shots that turn out best, maybe? It always amazes me when young kids come up to me and speak like five languages and barter in all five! …I can barely speak English. Incredible place it must’ve been amazing to see it. Thanks Ratheesh, yes it really was incredible. It’s one of those places that, for me anyway, as soon as I saw the pictures of it I knew I want to go there. And I’m really glad we did. Thanks Jo. 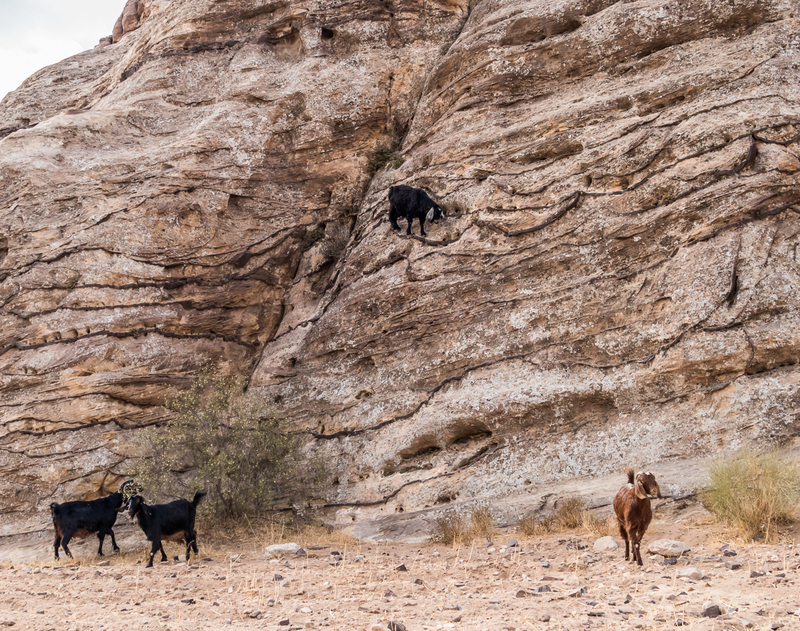 Those goats were all over the cliffs. They just about walk on vertical rock. The paintings were quite amazing – so old and very rare. Such wonderful photos. My niece passed by Jordan (yes, Petra) last December on her way to the Holy Land to spend Christmas there. She sent me several pictures similar to what you posted here, yours are even better because of the lovely narrative. Thank you so much Arlene. I’m glad you enjoyed my story of the Bedouin. It’s a really magical part of the world. Thank you for this fascinating post! As usual your photos are incredible! Thanks Mo. I’m glad you enjoyed it. It was an amazing place!